We offer you personalized and individual service for charters and shuttles using comfortable minivans, many of which are also wheelchair accessible. 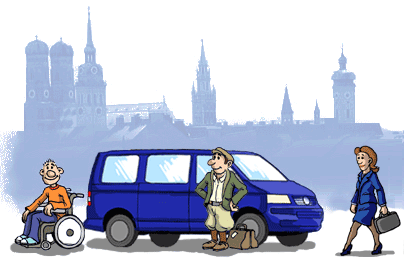 For daily trips or European tours, regularly scheduled shuttles or spur-of-the-minute standard routes, we can be your well-experienced and reliable transportation partner. Many of our clients have done business with us since the company’s inception in the mid-eighties. With personalized service, we can create customized transportation for your needs. Please do not hesitate to contact us with your requests and opportunities. Our advice is free and we will always find a transportation solution to meet your needs. On the following pages, you will find detailed information on our charter, shuttle and wheelchair services, as well as how to contact us.